Our clients are our partners. Currently servicing over 170 hospital sites, the HandyAudit team works closely with facilities using the experience and feedback from clinical practitioners to refine our novel hand hygiene auditing tool. HandyAudit was chosen as an example of Adopting Research to Improve Care by the Council for Academic Hospitals of Ontario (CAHO). HandyAudit is used in 64% of the academic hospitals in Ontario. Below are a few words from our clients: Cindy Rogers, Hand Hygiene Coordinator at Hamilton Health Sciences and Dr. Matthew Muller, Associate Medical Director, Infection Prevention and Control at St. Michael's Hospital. Hôpital Montfort, a HandyAudit client, saved more than $242,000 by cutting infection rates by 50% over the course of a year! Congratulations Jose and all the team at Montfort for terrific work! Markham Stouffville Hospital, a HandyAudit client, has the lowest number of preventable deaths in the Greater Toronto Area (Dec 2011). Congratulations! One of our clients, Hamilton Health Sciences, is ranked among the top research hospitals (Dec 2011). Congratulations! 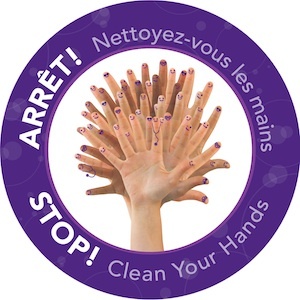 Montfort Hospital, one of our clients, won the "Stick it to Hand Hygiene! sticker design contest" run by the Canadian Patient Safety Institute. Congratulations! HandyAudit is being used in 100+ sites!